SCA is a condition in which the heart suddenly and unexpectedly stops beating. When this happens, blood stops flowing to the brain and other vital organs. SCA usually causes death if it's not treated within minutes. In fact, each minute of SCA leads to a 10 percent reduction in survival. Using an AED on a person who is having SCA may save the person's life. To understand how AEDs work, it helps to understand how the heart works. The heart has an internal electrical system that controls the rate and rhythm of the heartbeat (see heart rate). With each heartbeat, an electrical signal spreads from the top of the heart to the bottom. As the signal travels, it causes the heart to contract and pump blood. The process repeats with each new heartbeat. Problems with the electrical system can cause abnormal heart rhythms called arrhythmias. During an arrhythmia, the heart can beat too fast, too slow, or with an irregular rhythm. Some arrhythmias can cause the heart to stop pumping blood to the body. These arrhythmias cause SCA. The most common cause of SCA is an arrhythmia called ventricular fibrillation (v-fib). In v-fib, the ventricles (the heart's lower chambers) don't beat normally. Instead, they quiver very rapidly and irregularly. Another arrhythmia that can lead to SCA is ventricular tachycardia. This is a fast, regular beating of the ventricles that may last for only a few seconds or for much longer. In people who have either of these arrhythmias, an electric shock from an AED can restore the heart's normal rhythm. Doing CPR (cardiopulmonary resuscitation) on someone having SCA also can improve his or her chance of survival. Learning how to use an AED and taking a CPR course are helpful. 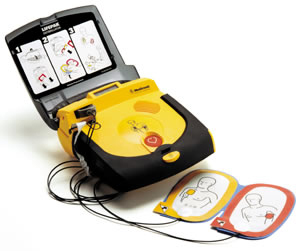 However, if trained personnel aren't available, untrained people also can use an AED to help save someone's life. You often find AEDs in places with large numbers of people, such as shopping malls, golf courses, businesses, airports, airplanes, casinos, convention centers, hotels, sports venues, and schools. You also can purchase a home-use AED. Ninety-five percent of people who have SCA die from it – most within minutes. Rapid treatment of SCA with an AED can be lifesaving. If someone is having SCA, you may see him or her suddenly collapse and lose consciousness. Or, you may find the person unconscious and unable to respond when you call or shake him or her. The person may not be breathing, or he or she may have an abnormal breathing pattern. If you check, you usually can't find a pulse. The person's skin also may become dark or blue from lack of oxygen. Also, the person may not move, or his or her movements may look like a seizure (spasms). An AED can check the person's heart rhythm and determine whether an electric shock is needed to try to restore a normal rhythm. Automated external defibrillators (AEDs) are lightweight, battery-operated, portable devices that are easy to use. Sticky pads with sensors (called electrodes) are attached to the chest of the person who is having sudden cardiac arrest (SCA). The electrodes transmit information about the person's heart rhythm to a computer in the AED. The computer analyzes the heart rhythm to find out whether an electric shock is needed. If a shock is needed, the AED uses voice prompts to tell you when to give the shock, and the electrodes deliver it. Using an AED to shock the heart within minutes of the start of SCA may restore a normal heart rhythm. Every minute counts. Each minute of SCA leads to a 10 percent reduction in survival. Learning how to use an AED and taking a CPR (cardiopulmonary resuscitation) course are helpful. However, if trained personnel aren't available, untrained people also can use an AED to help save someone's life. Some people are afraid to use an AED to help save someone's life. They're worried that something might go wrong and that they might be sued. However, Good Samaritan laws in each State and the Federal Cardiac Arrest Survival Act (CASA) provide some protection for untrained bystanders who respond to emergencies. Facility owners who are thinking about buying an AED should provide initial and ongoing training to likely rescuers (usually people who work in the facility). Also, it's important to properly maintain an AED and notify local emergency officials of its location. What are the risks of using an automated external defibrillator? Automated external defibrillators (AEDs) are safe to use. There are no reports of AEDs harming bystanders or users. Also, there are no reports of AEDs delivering inappropriate shocks.